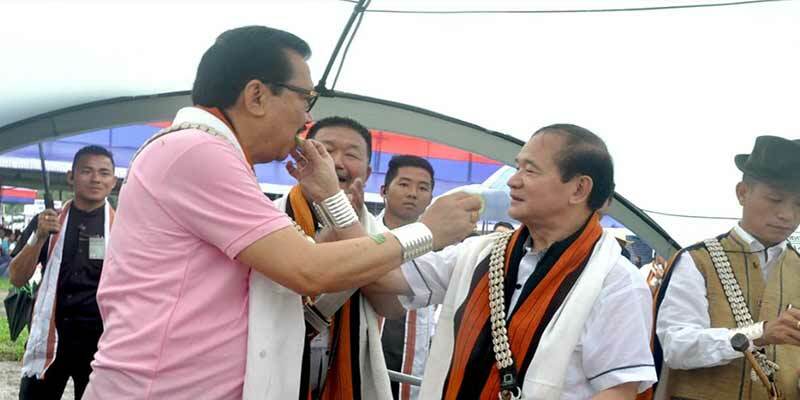 The Deputy Chief Minister of Arunachal Pradesh Chowna Mein called the Apatani’s as one of the most traditional tribe of the State, other tribes need to learn from them. Attending the Capital Complex Dree Festival Celebration at Papu Nallah Dree Ground here today, Deputy Chief Minister, Chowna Mein hails Apatani Community for jealously up keeping their cultural identity that was handed down by their forefathers through ages. He called the Apatani’s as one of the most traditional tribe of the State and said other tribes need to learn from them in terms of preservation of culture & traditions. He said that because of their efforts in keeping their traditions and culture alive, Ziro Valley is known all over the world today and many tourists from across the globe come to see the valley. He said that State Government will give every support to enable Ziro Valley to be declared as one of the World Heritage Site. He further stated that Arunachal Pradesh is a hot-bed for research scholar due to its rich diverse cultures and traditions and the State Govt has kept provision in the Budget for research and documentation of unique tribal cultures & traditions of the State adding that Govt will provide every support for upkeep of the cultural identity and traditions. He further said that the Arunachal Pradesh is one of the most beautiful State because of its cultural diversity and beautiful landscapes. Citing the present period as the age of technology and innovations, he called upon the youths to use the technology to their advantage in more positive way. He urged them to shun the negativity and instead make use of internet like YouTube and social media for promotion and publicity of our unique cultures, scenic beauties and beautiful landscape to the outside world which would give fillip to tourist’ flow in the State. He further said that depending solely in the Govt for everything will not work for long but opined that community need to develop a sense of involvement and belongingness for all round development of the State. He assured to fulfil his left out assurance which he made during his participation in the festival last time. On the occasion, the dignitaries released, Dree Festival Souvenir title ‘Reading in Culture & Tradition’, Yellow Page Booklet ‘Tanii Duko’, a CD on ‘Dree Mythology & Committee Songs’, Popiriscope and an audio album ‘Popi Sermi Vol.VI’ and a You Tube Documentary Film ‘Michi’. The dignitaries also give away felicitations to the meritorious students of Apatani Community which was felicitated by the Apatani Career Guidance Forum. Among others, Former Chief Minister, Nabam Tuki, Parliamentary Secretary for PWD, UD & Town Planning, Techi Kaso and former Minister, Padi Richo also attended the festival. Cultural items including Daminda (Mega Dance), Apatani Folk Dance and presentation of Dree Mythology in the form of drama were the other attractions of the festival.